If you live in the UK you will be familiar with rain and you’ll probably be familiar with riding in it too. Unfortunately, rain is unavoidable and while you’ll probably never relish the opportunity to go out on your bike when it’s hammering down, it’s not something you should be scared of. 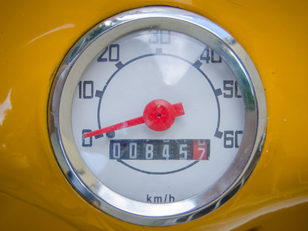 And if you are fearful of it, it’s something that you should really work on because, as we mentioned, you’re going to have to do it at some point – that’s one of the downsides of riding a motorbike in the UK. The good news is that it’s not difficult; in fact it’s not even that different from riding in dry conditions. Why are riders scared of the rain? You don’t need to be a rocket scientist to know that water reduces your traction on the road as it creates a layer between your tyres and the road surface. Then there’s the problem of visibility and the fact that previously non-slippery surfaces and road markings become slippery – less traction means longer braking distances. If you’ve got the wrong equipment and gear, you’ll also suffer – so all in all, you can see why lots of riders are fearful of riding in the wet. However there are lots of techniques, pointers, equipment and gear that can combat these problems. The first 15 minutes of rain are the worst when you’re on the road. That’s because oil, fluid, fuel and muck are deposited on a road’s surface over time. When it rains, these deposits mix with the water and sit on the road surface making riding more treacherous. These deposits are usually dispersed and washed away after 15 minutes – if you are on the road when it starts belting down, think about pulling over and waiting it out for 15 minutes. Modern bikes are littered with features and systems that help you ride smoothly and safely on the road. 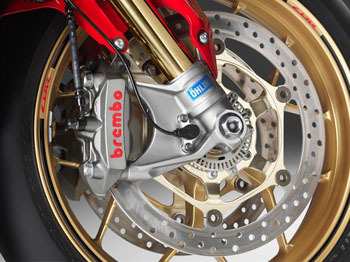 From ABS to high-performance tyres, all of your bike’s systems will aid you and they still work in the wet. The only difference with riding in the wet is that their effectiveness is diminished slightly, so your riding skills are more important than ever. While that may have some of you quaking in your boots, it shouldn’t: if you’re a competent rider you’ll still be competent in the wet, as long as you adjust. In terms of clothing, there are a wide range of waterproof options available. One of the most important things about motorbike clothing is to make sure that it all fits properly. A coat that is too big will allow water in. Gloves that are baggy will allow water that trickles down your sleeves into them and Boots that are too large will do the same too. All this means you’ll feel uncomfortable in the wet and an uncomfortable rider is a distracted one, something you can’t afford to be on wet roads. Therefore it’s vital that your clothing is not only waterproof, but fits well too. It’s also worth remembering that leather suits can get pretty heavy when wet! 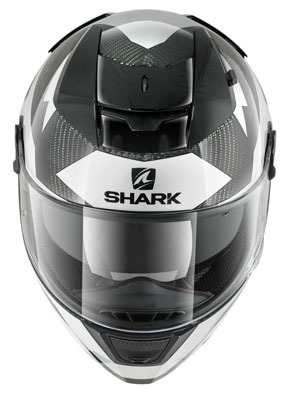 Whether you ride with an open face helmet or a visor, you’ll need to make some adjustments in the rain. Visors, when ventilation isn’t great, will steam up and that should influence your decision making when buying a new helmet. And while open face helmets won’t throw up ventilation issues, rain drops hurt, especially at speed. Think about a bandana or some sort of face protection. If you’ve ever watched Formula One or MotoGP, you’ll notice that when it rains, teams, riders and drivers change their tyres; they move from slicks to wet tyres and the difference is tread. Slick tyres don’t have any tread because they aim to put as much of the tyre in contact with the road surface as possible, generating maximum traction. But that’s because there’s nothing getting in the way of rubber and tarmac. If something’s in the way, you move it. And when water is in the way, tyre tread disperses it – very generally, the more tread the less water in the way and the more traction. If you know you will be riding in the wet frequently, it might be an idea to change to wet tyres or, for the best of both worlds, stick to all-weather rubbers all year round. Road markings, manhole covers and smooth road surfaces will all be more treacherous to ride on in the wet. It’s simple physics – any surfaces that are not porous will be slippery to ride across as the water that falls on them has nowhere to go and it sits on the surface. Try to avoid riding over them as much as possible and, if slippery surfaces are unavoidable, try to ride across them in a straight line, avoid braking on them and keep the bike as upright as possible. Puddles themselves are not too hazardous as it’s difficult to aquaplane on two wheels however they can hide what’s underneath them. 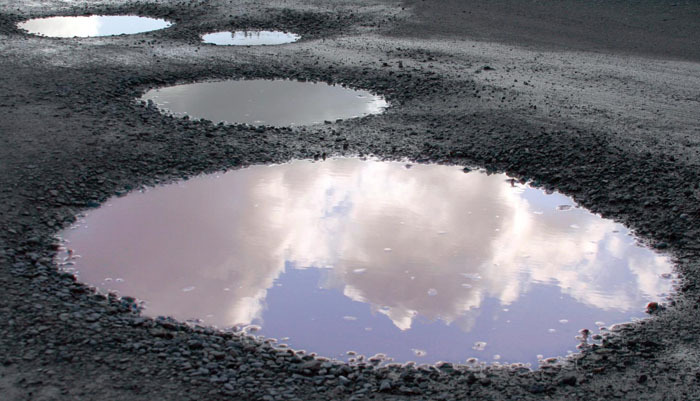 A puddle can cover manholes, road markings or potholes, so try to avoid riding through them if you can do so safely. If not, cross through slowly – this will reduce the chances of aquaplaning and also the effects of any potholes or slippery surfaces. Oil is treacherous in the dry as well as the wet – the one advantage of riding in the wet is that it’s sometimes more identifiable as oil gives off a rainbow-coloured sheen on a road’s surface – avoid patches that look like this. This is nothing new when you’re riding your motorcycle but it’s all the more important when you’re riding in the wet. The sooner you see puddles, slippery road markings and oil spills, the more time you have to adjust and minimise their effect. Similarly, the sooner you see corners and hazards, the more time you have to react because, remember, in the wet your braking and stopping distances are longer. By being aware of turns and hazards before they’re upon you, you will have more time to adjust smoothly and slowly, thus minimising the effects of reduced traction. If you’re slow to react to upcoming turns and hazards and you need to resort to sharp, sudden braking in the wet, you’re in trouble. Following on from being observant is braking – the quicker you see hazards and corners, the sooner and more smoothly you can apply your brakes. The key to successful braking in the wet is to do so smoothly and progressively. This will prevent your tyres from locking out which, in the wet, is integral to safe riding. Apply your brakes smoothly and you can still brake hard – the key is being steady. And practice – you should know what your tyres and bike are capable of in the wet. Don’t wait until an emergency to test out your tyres – practice braking in the wet in a safe place. The same laws apply to cornering in the wet as they do in dry conditions – to turn safely you need to generate turning and cornering forces by steering and your body’s position. By sitting upright you won’t do that, so you need to corner as you normally would. Your speed will also play an important part in your ability to corner safely in the wet – use the slow in, steady out method when cornering in the wet. Speed – or reducing it – is the most important message to remember when you’re riding in the wet. By reducing your speed you’re asking your tyres to cope with less, and traction is less of an issue. It also gives you more time to see and adjust to potential hazards. Tensing up can really influence your riding. If you’re tense and rigid on your motorcycle you’ll struggle to ride smoothly and that’s one of the keys to riding safely in the rain. Smooth braking, smooth acceleration and smooth decision making will all reduce the importance of traction, because nothing you do will surprise your tyres or bike and force them to look for traction suddenly. Don’t sit too upright and loosen up – that way, any loss of traction will not result in full body, jerky movements that greatly affect your handlebars and bike control. Like suspension, if you’re loose, any sudden slips, slides and jerks will be absorbed. Tyres disperse fluid from road surfaces so make use of the tyres on the vehicle in front and ride in their path. First image courtesy of Bart Hiddink via Creative Commons. It has been adapted.